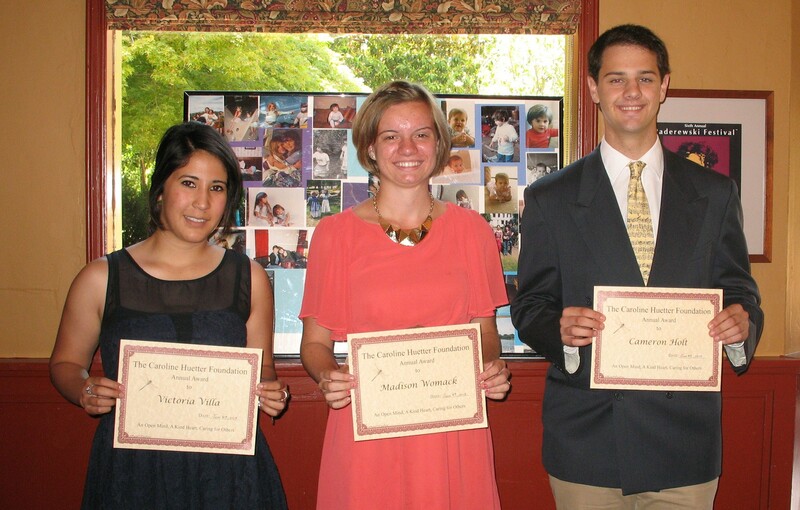 The recipients of the 2013 Caroline Huetter Award. From Left to Right: Victoria Villa, Madison Womack, and Cameron Holt. The Caroline Huetter Foundation is now accepting nominations for 2018 award recipients, and will review submissions this Spring. The Foundation was established in 2010 memory of Caroline Huetter, a daughter, sister and friend who died much too young. Caroline was a vibrant, loving young woman–a skilled artist and writer involved in music of all kinds. Her generosity to her friends and strangers alike inspired her family to create an award to honor the efforts of others to support and care for their communities, through education, music, or volunteering their time in other ways. The annual award is to recognize Central Coast young people (18-25) who embody her generous spirit, open mind, kind heart and caring for others. In prior years, young people have been recognized and rewarded with amounts up to $1000. There is no restriction on the use of funds. For more information and to make nominations, please download the nomination form. To submit call 805 462 8890 or write to TCHF Box 1471 Atascadero Calif. 93423. You may also submit nominations to CarolineFoundation@gmail.com. You can find out more information by visiting our Facebook page. We will be reviewing the next round of nominations this fall. Charlie Shoemake here. Just a little query as to the whereabouts of John Huetter. For the past couple of years he was a semi-regular at our Famous Jazz Artist Series when it was located in Paso Robles but for the past 7 or 8 months (we moved the series back to Cambria for much bigger support and attendance) we haven’t seen or heard a thing from him. Just wondering if he’s still o.k. He was a supportive person to the series and to our central coast jazz institute even though his own foundation was not involved in the musical arts. We recently sent him an e-mail but received no reply. Hi Charlie. Thanks for following up. John is doing fine, he has just been wrapped up in a personal project. It is finally finished and he should be more active now. We can follow up with him regarding the email, it is possible it just got lost in the shuffle.